The weather might be a little hit and miss at the moment, but as soon as the sun does break through again, we know what we want to be wearing. At every possible moment over the last week, Victoria Beckham has been spotted working what can only be described as a pair of power sunglasses – and we are tipping the new shape as the one to wear. 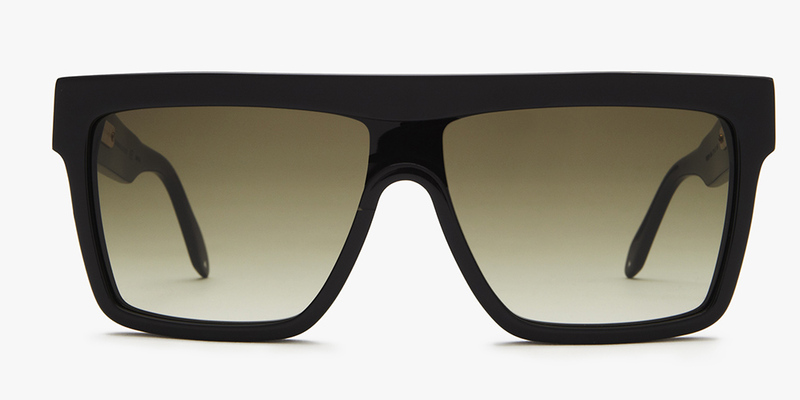 Called the Flat Top Visor, VB’s oversized frames are squared off into a sharp, edgy shape at the front. They instantly add edge to even the prettiest of summer looks and, as they’ve literally launched this week as part of the designer’s AW16 collection, snapping them up now would keep all of us ahead of the curve. The style is priced £265 and is our favourite from Victoria’s new eyewear launch – a 20+ piece collection that also includes aviator and cat eye frames, plus Victoria’s usual summer signature, the VB. It’s clearly her personal favourite, too, as she’s worn hers day to night, indoors and outside, for the last week. VB’s always been the first to try new trends and has certainly road-tested her fair share of frames over the years. Remember the rose-tinted Outta Your Mind specs, or the golden WAG aviators? Don’t pretend you didn’t copy them on her instruction. But if the strength of shape in this particular style feels too dominating for you, fear not, as the visor comes in three colours, including a softer green and amber, and a tortoiseshell combo. ‘Sunglasses always hide a multitude of sins,’ Victoria once said. ‘Sunglasses and a great pair of heels can turn most outfits around.’ Well now our summer shades icon has spoken again, and frankly we couldn’t agree more. The Flat Top Visor is available now, priced at £265 from www.victoriabeckham.com.